I live in Sandwich, but all I can think about is Pizza. 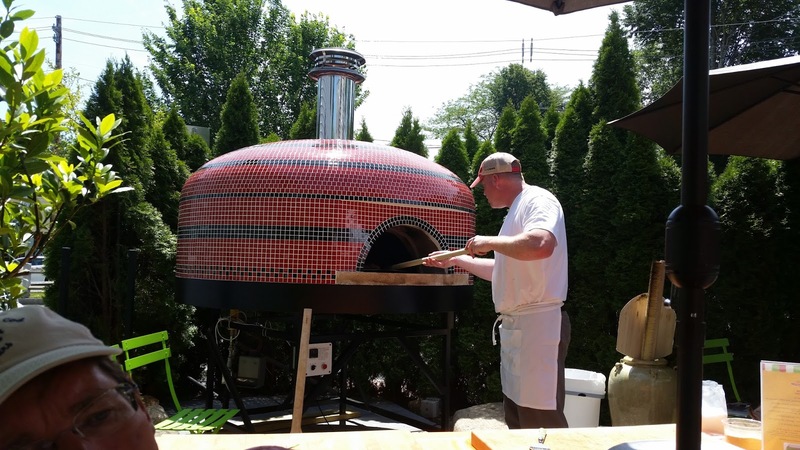 Even though on Saturday June 27, our town of Sandwich is celebrating its annual Sandwich Fest, all I can think about is Pizza. During Sandwich Fest, we close town Water Street, overlooking the beautiful Shawme Pond, for a festive all day street fair that this year includes over 90 Street Vendors, Juried Local Artists, Craftsmen, and Retailers. The main focus of the day is the selection of the “Best Sandwich in Sandwich”. The town’s restaurants and cafés offer their best culinary specialties in hopes of winning the Sandwich crown and bragging rights for the next year. So why can I only think about Pizza? Because the Brown Jug just fired up its new outdoor pizza oven and is now offering some of the best pizza I have ever tasted. 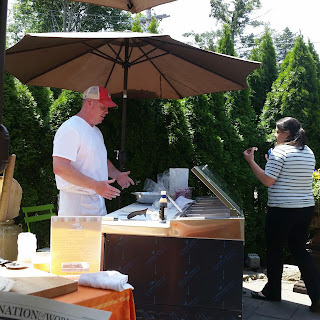 Since we returned from Florida, we have watched as Brown Jug owner, Michael, transformed the side patio from what was a lovely secluded space to a wonderful Italian style outdoor Pizzeria. First, the old crab apple tree that dangerously bombarded you with falling apples was removed to expand the paver tiled area that was to be the future home of the new pizza oven. Michael also added a new gated side entrance and a beautiful canvas awning. We missed the day the crane lifted the massive oven over the arborvitae hedge into its new home. The oven itself is a work of art with its' hand crafted Italian mosaic tile exterior that houses a state-of-the-art oven assembly. It took a few days to connect and adjust the new equipment, but it was worth the wait. As always, Michael uses only the finest ingredients with which Jamie, the pizza master, was creating unbelievable pies. Many of us locals knew about the Saturday test run and soft opening that offered ‘free’ pizza; we did plan our lunch break around this event. Paula from the Dunbar Restaurant and Tea Room, also an accomplished chef, was already promoting the new pizza as not only the Best in Sandwich, but also the Best on Cape Cod. Our Inn guest from New York, who heard about the Brown Jug from us over breakfast, had high praise for creative offerings, and they are no strangers to great pizza options. This is why I can only think about Pizza and am looking forward to lunch and another great experience at the Brown Jug. I hope you will visit Sandwich for the annual, fun Sandwich Fest, but save a little room for a slice of pie at the Jug.